The NEW BCA 3.0 Gun Holster still has the same features that made our BCA the BEST OWB gun holster in the industry. So how did we change something so iconic without taking away from it? Well, for starters, we made it personal. How? By adding a retention setting to it. Now you can take your desired retention and apply it to your gun holster. You can go from a medium light retention to a very heavy retention. Ideal for anyone who carries. We have also taken away from itʼs footprint by eliminating material from itʼs bottom corners to make it smaller and lighter. This makes it a very comfortable OWB gun holster while still keeping itʼs well known characteristic of staying close to your body. Finally. We now use a diversified Polymer plastic that is known for its ideal balance between rigidity, impact strength and hardness to protect your firearm at all times. Whether you are reholstering consecutively at the range or just carrying while protecting yourself and those around you on a daily basis, know that your firearm is secure and safeguarded. All this makes the NEW BCA 3.0 Gun Holster just as good as itʼs predecessor while inheriting a little flair to it. • NEW Polymer plastic provides supreme rigidity and impact strength assuring protection of your firearm. • Designed for outside the waistband carry, but can easily be converted to inside the waistband by swapping out the belt loops with our IWB belt clips. • 10° cant enhances concealment under loose garments. • Robust 1.50” or 1.75” injection molded belt loops prevent breakage even under rigorous use. • Belt loops can be replaced with Belt Clips for inside the waistband carry. • The BCA creates adequate room for a positive grip thus enabling a smooth draw with solid weapon retention. • All edges on holster are rounded for comfort. 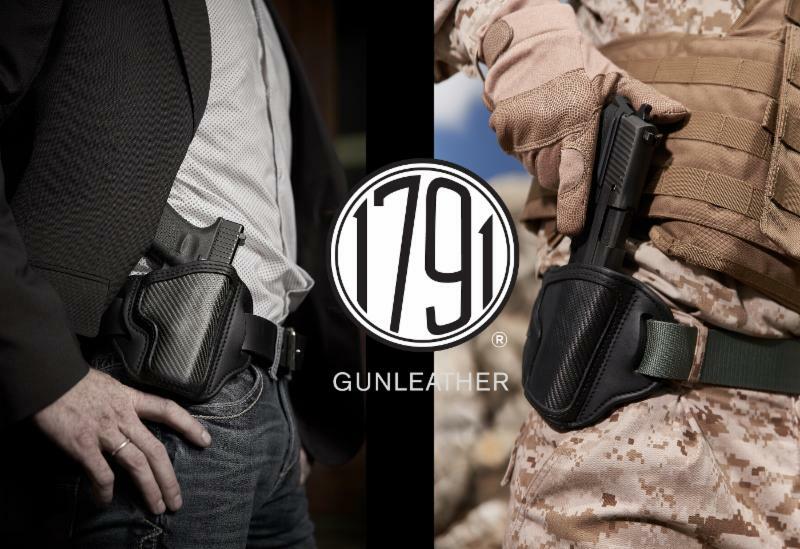 • All holsters are curved to fit the contours of your body. POST FALLS, Idaho (Feb. 12, 2018) – Alien Gear Holsters’ new ankle holster and ankle carry expansion pack are now available for purchase after years of development. Alien Gear Holsters has steadily expanded holster variety from Alien Gear Holsters’ original waistband style of holsters, to offer more options for a wider amount of carrying preferences. 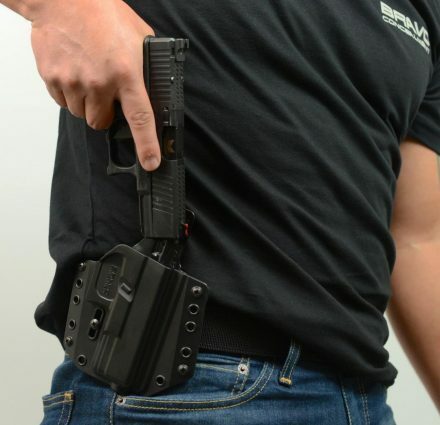 The ShapeShift Ankle Holster is a comfortable solution for those that sit all day, are looking for an alternative to waistline concealment or carry a backup firearm. The ShapeShift Ankle Holster draws stability from a two-strap system that anchors at the heel, setting it apart from other ankle holsters. This design, combined with a premium engineered polymer spine for stability, ensures the ankle holster won’t slip down or compromise security. 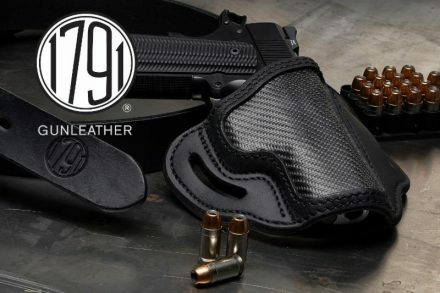 Alien Gear Holsters’ Designer Taylor Vold has been involved with the ankle holster since its inception two years ago. 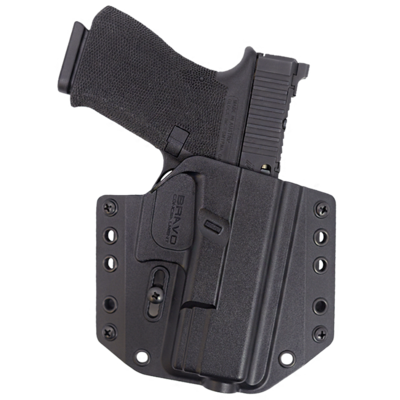 The holster is compatible with the ShapeShift Modular Holster System, and quickly switches to a large variety of IWB, OWB and tactical style holsters. The system was designed to allow carriers more holster options for a significant reduction in cost. For those who already own the full shell configuration, the expansion pack is the most cost-efficient option at $37.88. Purchase the full ShapeShift Ankle Holster for $61.88 at AlienGearHolsters.com/ankle-gun-holsters.html. The Ankle holster is backed by a Forever Warranty and a 30-Day Test Drive. (For immediate release) October 11, 2016. Chad and Shawndalyn Myers, owners of JM4 Tactical, are very proud to introduce to you the Pink (QCC) Quick Click and Carry Holsters to benefit The American Cancer Society. JM4 Tactical is joining the fight against cancer and will donate a portion of the proceeds from every pink holster sold. With each Pink QCC you purchase you will have a chance to win a custom made ladies leather western belt made from the JM4 Collection in your choice of black or brown. The belt buckle and conchos were a limited edition item manufactured over ten years ago. Now you have a chance to get your hands on a belt made from one of the last known buckle/concho combos available making it a true one of a kind. Your name will automatically be entered for every Pink Holster you purchase. To be entered, orders must be placed by midnight CST, November 11th 2016 and the drawing will the held Thanksgiving Day, November 24th, 2016. 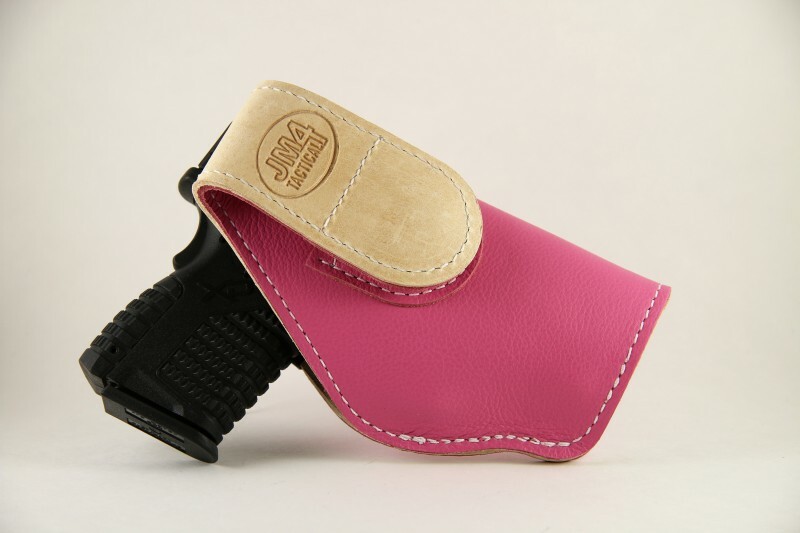 Each Pink QCC Holster comes in small, medium, large, extra large and J-Frame. Each size fits a variety of guns. JM4 Tactical is owned and operated by Chad and Shawndalyn Myers of Abilene, Texas. Chad has a history in production and is a former United States Marine. Shawndalyn has a background in office management and finance. JM4 Tactical prides itself in customer service and integrity. All JM4 products are proudly made and manufactured in the USA. Please check us out at jm4tactical.com. Black Rhino Concealment is a Veteran-owned and operated business which manufactures custom kydex holsters for over 80 handgun models, as well as magazine carriers. 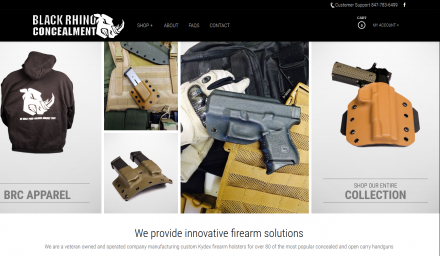 Their holster offerings include the TCS – Tactical Carrier System, a 90/10 mold holster which can be worn either outside the wasteband or inside with the IWB Conversion Kit, which is included with every holster at no additional charge. Aside from also offering the TCS with the option to support a pistol-mounted light, Black Rhino offers a concealed carry specific holster, as well as a trigger guard holster. The holsters can be ordered specified for left or right hand carry, as well as with various cants, and custom colors. As a special offer to Tactical Fanboy readers, you can take 10% off your order by using the discount code tacfanboy at checkout.